Who knows where the Nations League will take us; but from an Irish perspective, we will never forget where, when and how it all began. It started with a large serving of Rice, yet this particular dish was neither sweet nor savoury just a week out from Ireland’s opening encounter, a tricky away trip to Cardiff. That particular game was intended to serve two purposes. Firstly, a long awaited chance to banish the Danish demons, which prevented Ireland from qualifying for the 2018 World Cup. And more importantly – looking forward instead of backwards – a chance to hand teenage prospect Declan Rice his first competitive appearance for Ireland, signalling the dawning of a new era for Irish football, while ticking the most valuable box of ensuring that the English born midfielder would forever wear green, and green alone. "It’s the defeats that stay with you," said O’Neill, in the build up to that Nations League opener. By his own admission, O’Neill had been brooding over that dark November night in Dublin when Denmark ran amok, waiting ten months for a competitive fixture to right the wrongs of the 5-1 hammering. And there were a lot of wrongs to right; the players had to put in a performance, while O’Neill himself was also guilty of some very poor judgement calls that backfired catastrophically. When the news broke that Rice was not coming, the player’s decision caused disappointment rather than despair. But then Harry Arter happened. And on to the last leg of this international window. An away trip to Poland to fulfil one of those meaningless friendly games, the ones that were meant to be consigned to history by this latest UEFA invention. The Ireland manager would spend the entire build-up attempting to explain the latest saga and by the time kick-off came around, O’Neill was, no doubt, relieved to be back to the business of playing actual football matches. After shipping nine goals in their last two competitive outings, Ireland could ill afford another spanking and it was no surprise to see the manager put out an experimental side, which, regardless of result, would deflect any further criticism of his actual on-field responsibilities. As things transpired, the experiment went quite well and Ireland came within five minutes of winning an away game against a side who played – albeit not too well – at the summer’s World Cup, while also impressing last Friday with a well-deserved 1-1 result in Italy. Aiden O’Brien was handed his international debut, and repaid the manager with a goal on his maiden appearance in green, while there were also positive performances from Enda Stevens and Shaun Williams on their first start for their country. O’Neill plucked Callum O’Dowda from relative Ireland Under-21 obscurity in the build-up to Euro 2016 and the Bristol City midfielder’s performance in Poland would have really pleased his under-pressure manager. O’Neill would have been forgiven for citing exhaustion by the time that final whistle blew in Wroclaw on Tuesday night. Yet speaking to RTÉ Sport after the game, the manager sounded, enthused, clear, consise, and, dare I say, confident. The manager was delighted with some of the performances, most notably goalscorer O’Brien, impressed with the attitude shown by Enda Stevens for playing through the pain barrier and enthused, by his own assessment, at least, that the morale of the squad was never in question. O’Neill may not necessarily have enjoyed this past international window, however, the former Celtic manager appears to feed off the controversy and as a result, thrive in adversity. Now thanks to that not-so-meaningless match with Poland, there can be a positive approach to next month’s games, unlike the Wales encounter, which, with the benefit of hindsight, was doomed before it even began. Cut from the cloth of the old school, O’Neill comes across as a manager set in his ways, loathe to change his style, maintaining mystery, however, international football management has proved a steep learning curve for the former club expert. At times, O’Neill’s side have been badly exposed, most notably against Belgium, Denmark and most recently Wales, however, this Ireland manager has also shown remarkable bouncebackability, as Iain Dowie might say. Questions have been asked since that 5-1 defeat to Denmark. Does O’Neill have the hunger to remain in the job? Has he taken this group as far as they can go? Have opposition teams learned how to play against and deal with a Martin O’Neill team? Questions have also been posed from within. The manager gave serious thought to his future following the World Cup play-off defeat and very nearly packed it in to return to the more familiar settings of club management. But the fact that O’Neill is still there and ready for the fight, shows that there is still a desire to enjoy at least one more foray with this Ireland squad. The manager may be in the job five years, but the last two weeks have offered a much needed refresher course on managing players, managing expectations, and most importantly, managing those within his own management team. Of course, O’Neill needs to get his side to put in two strong performances in Dublin next month and the manager knows that he will need to make some huge decisions, prove ruthless with squad selection and more ambitious with formation and tactics. Some loyal servants may find themselves excluded from the next squad, while others not so loyal are also set to miss out. The manager needs a united squad marching to the same beat for the next two games, and strong leadership is required following a tough few weeks for those in charge. Whatever happened off the pitch, there is no denying that O’Neill has got it wrong, horrifically wrong, over the past two competitive games. The manager put his hand up following the Denmark game, acknowledging that he got it wrong, when his gung-ho second-half tactics backfired, however, in the Wales game, he appeared to put the blame back on the players for the individual errors, which caused the goals. It was no surprise to see a more organised formation in Poland, and expect to see more of the same for the October encounters. Results aside, Ireland, and O’Neill in particular, cannot afford to be on the end of another hammering. "The Under-19s won, the Under-16s won and I think there are a group of players coming through that we are naturally hopeful that they become top class international players, playing for top class sides," said O’Neill. It is not too long since the manager was talking about the successful Under-17 side who qualified for the European Championships, but on that occasion he was equally dismissive of any young players coming through during his own tenure. Perhaps 17-year-old Ethan Ampadu’s performance for Wales against Ireland may have opened O’Neill’s eyes to the consideration that the energy and exuberance of youth could offer options on the rocky road ahead. There will be no time to brood over the next three or four weeks, as O’Neill knows the pressure is on for performances against the two sides who essentially put him in this predicament. The next squad announcement will let us know whether bridges have been rebuilt, futures have been decided, players left out or players brought in. 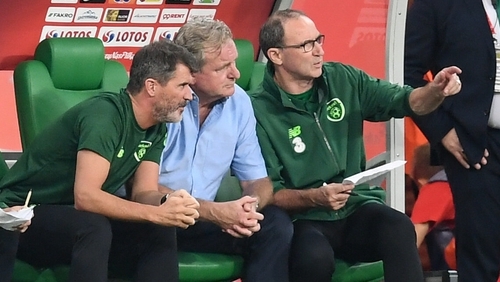 Four days in October will tell us a lot about Ireland's prospects on the road to Euro 2020, and it might tell us even more about Martin O’Neill.